Elwood is of average height and weight, and is fairly evenly proportioned. His coat is a monotone mixture of grey, black, and white hues. Perhaps his most striking feature is his eyes, which are a luminescent yellow. 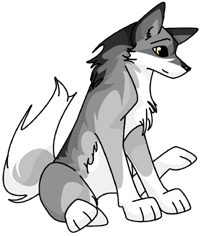 A thoughtful, patient, and considerate wolf, Elwood is governed by logic over emotions. He tends to think things through before acting, and is often hesitant to take risks. He is a loyal and dedicated family man and a homebody who is perfectly content living a life without travel. A practiced guardian and hunter by trade, he works hard to provide for his pack. Current time: April 21, 2019, 05:57 AM Powered By MyBB, © 2002-2019 MyBB Group.